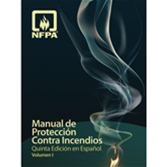 On the job or preparing of the CFPS exam, trust NFPA®'s Spanish Fire Protection Handbook® for knowledge on the A-Z of fire safety! Two volumes comprising more than 3,000 pages ensure that no aspect is overlooked. 200 chapters, including 20 new to this edition, put the latest facts at your fingertips. 247 authors who are leader in their fields provide trustworthy, field-tested advice. 14 in-depth sections organize information for fast easy data retrieval. Thousands of illustrations, photos, tables, and graphs deepen your understanding of essential concepts. A new chapter on fundamentals of safe building design details how design loads and forces, and building systems and components, impact safety in new and existing structures. The updated section on organizing for fire and rescue services includes new tactics for fire department commanders in added chapters on fire service training, and alternate water supplies.